For the second day of Chocolate Brownie Theme Week, that would be today, I selected a gluten-free, wheat-free, Triple Chocolate Truffle Brownie from Mariposa Baking Company (Oakland, CA). 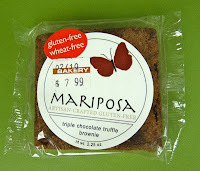 Mariposa makes all kinds of yummy gluten-free baked goods that are, on average, much better than most gluten-free alternatives. Their frosted cinnamon rolls look almost like the "real" thing, and I hope to try them soon. Back to today's brownie selection. This triple chocolate truffle brownie was just the right amount of soft and chewy with rich chocolate flavor; and it was dense, without being heavy -- an apparent contradiction, but a delicious one.